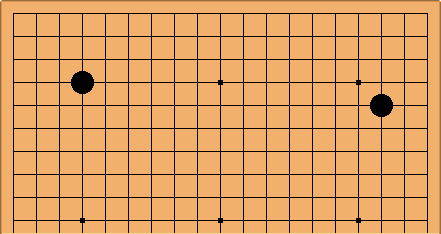 This page is about patterns occurring on one whole (19 by X) side of the board. 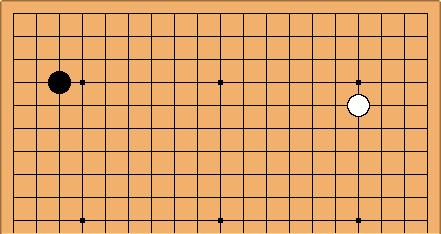 If you were looking for standard sequences occurring on the side, near the edge of the board, see side joseki. For the status of common groups on the side see side shapes. Side patterns can first be classified into two major groups, those involving stones of the same color, and those involving stones of different colors. To distinguish between formations of the same color and those of opposite color, we use "and" to denote stones of the same color and "vs." to denote stones of different colors. 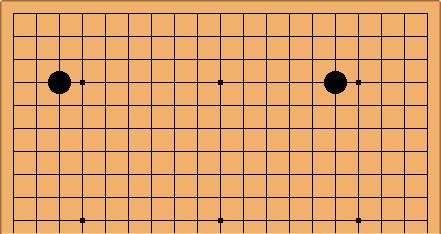 For example "4-4 and 4-4" for two adjacent 4-4 points of the same colour, and "4-4 vs. 4-4" for a black and a white stone facing eachother. The other way a 4-4 and 3-4 stone can be related along a side is like this. 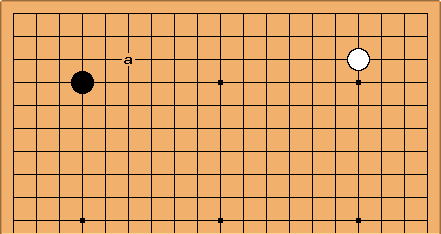 In this case, the coordinate 3 is listed first for the 3-4 stone, indicating it is on the third line from the relevant side. The wedge variants path includes a number of examples drawn from standard side patterns such as nirensei. The co-ordination between adjacent corners page is trying to get a grip on some more advanced issues. 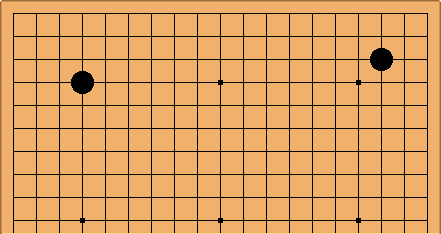 A little research on side patterns shows the importance in practice of outliers: stones at the 3-10, 4-10, 3-9 and 4-9 points. (Outlier means a minor part of a geological formation.) These affect greatly the choice of play on the side in pro games. It is wrong, therefore, to disregard their possible effect on side patterns (even if it may mean 17 times more work). See side patterns - outliers for an introduction. b Side pattern 4-4 and 3-4? c Side pattern 4-4 and 4-3? d Side pattern 4-4 and 3-3? 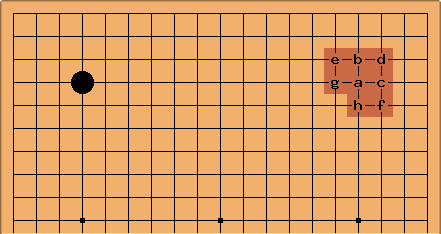 e Side pattern 4-4 and 3-5? f Side pattern 4-4 and 5-3? g Side pattern 4-4 and 4-5? h Side pattern 4-4 and 5-4? a Side pattern 4-4 vs. 4-4? b Side pattern 4-4 vs. 3-4? c Side pattern 4-4 vs. 4-3? d Side pattern 4-4 vs. 3-3? 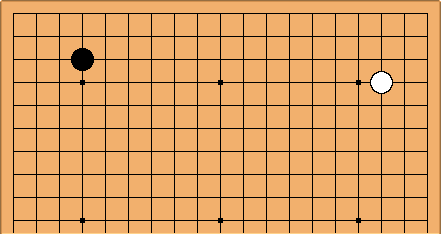 e Side pattern 4-4 vs. 3-5? f Side pattern 4-4 vs. 5-3? 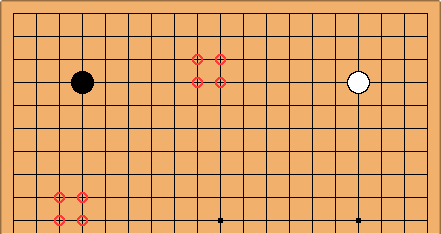 g Side pattern 4-4 vs. 4-5? 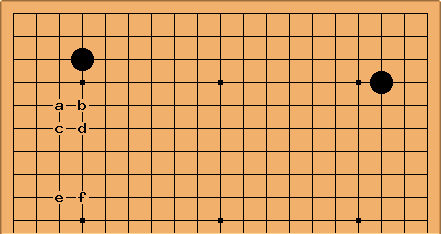 h Side pattern 4-4 vs. 5-4? Can develop into the Kobayashi Mark I after White plays at a. This is possibly the most complex and rich side pattern - appearances to the contrary - judging by the number of mainstream continuations (about 20). 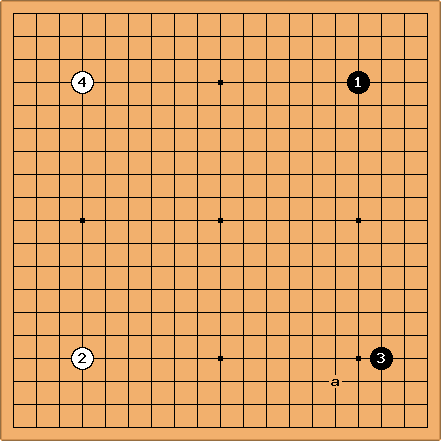 Develops into the Chinese after Black adds a (low chinese) or b (high or revised Chinese). Develops into the Mark II Kobayashi formation when Black adds c.
See intermediate plays for a pattern after White approaches at d.
Can develop into pushing battle and counter-pincer joseki family after Black plays at b. 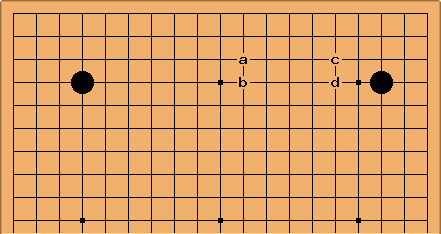 Develops into an enclosure opening when Black adds a, b, c or d.
Develops into a Chinese-style enclosure opening when Black adds e or f.
These side patterns matter after the strategy of preventing the formation of the Chinese opening. John F. For my money, Charles's work on side patterns, which was also one of the highlights of the old MSO site, is one of the most important contributions to go teaching by a westerner. And I can go back a long way. Can I suggest one tiny improvement? , and ; are not always very clearly distinguished either on screen or in print, and it is not obvious which is which. Using a hyphen for ; would aid visual clarity, and by analogy with the already accepted 4-4 usage would tell us instantly it means same-colour stones (or = instead of - may be even more obvious). For , I'd suggest something more substantial: ^ or *. Or ! with the well-known "not" meaning implying opposite colours?????? One other thing I'd like to suggest is naming various parts of the side. I've a feeling that five parts can be distinguished. If we think of the corners as cities and the area below the centre hoshi as the countryside, the bits in-between are the suburbs. These areas seem to come up often enough in modern discussions of theory to be worth naming. I haven't seen a settled Japanese name, so it's up for grabs. Charles I can certainly change the notation - it's an example of the sort of thing that I'd use in private notes. How about + for stones of the same colour, for starters: H+S is hoshi plus sansan. And maybe H/S for different colours, hoshi versus sansan? As for sensitive side areas, I know whence John is coming on this one. Still a bit premature, methinks. I mean, there is something at http://gobase.org/studying/articles/matthews/fuseki/14/ and something here at preferring to pincer; and the Go Seigen ideas John was talking about in December at the BGA Training Day. But before I rush into some synthesis, I think I'd like to get more research together. John F. Just mulling over the notation a bit more before Harry Potter takes over the weekend, +/ seems a big improvement on ,; and I wondered whether there was any value in using // for parallel and one of ^ v < > for aspects of orthogonality? togo: There remains one problem: One letter 'o' respectively 'p' is not sufficient for orientation. 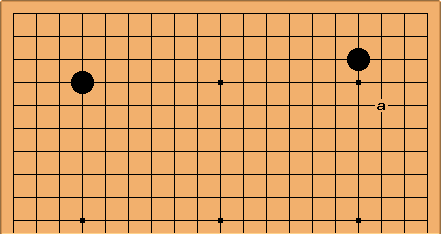 Both corners have two possible orientations regarding the side (except for H and S), giving four possible orientations for two non-symmetric corners. So each non-symmetric corner should have their own letter 'o' respectively 'p'. Also it would be a good idea to properly define 'orientation'. That might be the main direction of influence. Or the main direction of influence after adding one stone of the same color. 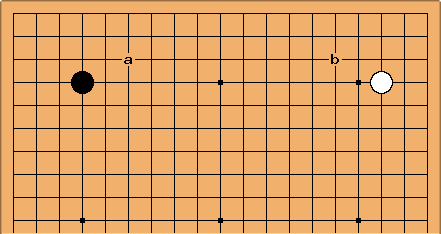 Bill: To avoid confusion with typical go usage of the term, side, which contrasts with corner and center, how about a title like, Half board patterns? or Opposite corner patterns?? The material on this page was a big surprise for me when I navigated here. Either of these titles would have been clear. The current one is ambiguous. Charles Bill, do I have to change the name of my web series to 'On Your Half-Board' to fit in with your conception? I don't see that opposite corner is clear - that says tasuki fuseki to me. I could make an alias for this page as whole side patterns? if it makes you happier. Bill: No, Charles, of course not. In fact, I think that your removes the ambiguity. :-) I am pointing out my confusion about the title of this page and its ambiguity. Hmmm. Thinking about it, I suppose that someone who created a page about side patterns in the other sense could call the page something like Patterns on the Side. 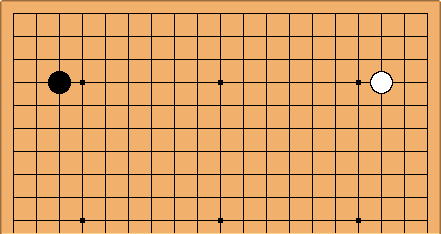 As for tasuki fuseki, I think the term is diagonally opposite corner. Later thought: One side patterns?. I think that that removes the ambiguity by the implicit contrast with the other side.